The Junior Dragster point’s series features quite a wide of events throughout the course of the 2017 chase. 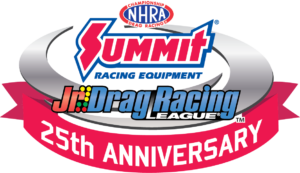 Firebird will be celebrating with the NHRA the 25th year of the Junior Drag Racing League. Both boys and girls aged between 5 and 17 years of age will compete at a number of races this season. The Junior class kicks off with a double header weekend at the Stinker Stores Season Opener on April 22-23, and continues through the final stop at the NAPA Halloween Classic on October 14-15. Juniors will also have an opportunity to make test runs on the following pre-season practice dates: April 2 and April 9, leading up to the official start of the new season.